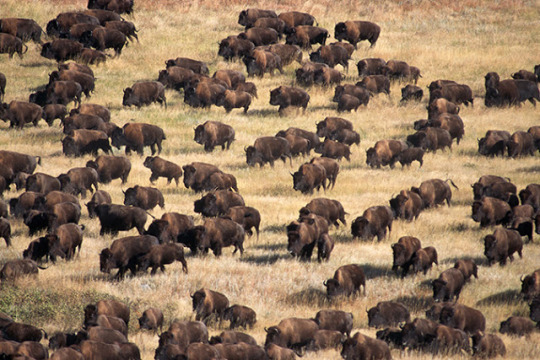 Native Americans attempting to stop a pipeline from being built on their land and water just got assistance from a large herd of wild buffalo. Indigenous culture honors American bison (known as Tatanka Oyate, or Buffalo Nation) as a symbol of sacrifice, as the bison give their lives to provide food, shelter, and clothing through the use of their meat and their hides. Native Americans maintain a spiritual tradition with bison, believing that as long as buffalo — a gift from the Great Spirit — roam free and as long as the herds are bountiful, the sovereignty of indigenous people would remain strong. And in the midst of mass arrests, mace attacks, and beatings from batons, a stampede of bison suddenly appeared near the Standing Rock protest camp. A cry of joy reportedly erupted from the Standing Rock Sioux, as they had been praying for assistance from the Tatanka Oyate during their standoff with riot police and national guardsmen. To read more about the pipeline that’s being built on land owned by Native Americans/indigenous people and what’s being done to those people as they protest and try to protect their land from this injustice, check out the Google News Search – tons of info! I usually don’t post about real life political and/or social issues here, but a real-life friend is asking everyone to help, and since she doesn’t have a Tumblr I’m posting it here. Please help out if you can even if it’s simply to spread the word. The Google Docs page for the pledge is Here. Not only are treaties being broken, but if and when the pipeline leaks or breaks, it’s going to contaminate their water (and their way of life) since it crosses over the Missouri river not just once but twice and is going right through their land. My friend and others from local tribes are asking for everyone’s help to support the tribes in the areas affected. The media isn’t covering this outside of the affected areas, and locals are reporting sudden service outages on their phones and other devices in and around the camps. Please keep in mind that this is a PEACEFUL PROTEST. No violence. No h4tespeech. An update on the situation. They’re now being sued for interfering, so if you can help in any way, please do so. Read about the latest situation Here. The good news is more and more people are hearing about it and it’s gone international, which means attempts to silence the protestors and local tribes aren’t working!